Without doubt one of the best investment decisions you could have made over the last decade was to have purchased shares in Chipotle Mexican Grill (NYSE: CMG) after the spin-off from McDonald’s. A modest $10,000 investment at the initial public offering price (IPO) of $22 would’ve nabbed you around 455 shares. By August of last year those same shares were changing hands for around $750 apiece. In other words your 455 shares would have been worth approximately $340,000 at the peak. Even if you bought after the 100% rise on the day of the IPO itself you would’ve seen that $10,000 starting capital increase by a factor of seventeen. Needless to say those are astonishing and potentially life-changing returns. Annual earnings went from $1.28 per-share in 2006 to around $15 per-share in 2015. That’s equal to compounded growth of 31.4% annually. Shareholder returns, assuming you bought at the $44 stock price seen at the close of trading after the IPO, would’ve been around 37% annually up to August, 2015. In other words new investors were gauging Chipotle’s growth prospects would carry on in the mould of the previous ten years, which, after a decade of blistering growth, was always going to be a potentially dangerous prospect without a margin of safety. The way I see it with these stocks is that if you’re thinking out to the long-term it always helps to compare them to the best in class candidate. In this case that inevitably means McDonald’s. Now, for a bricks and mortar food retail joint Chipotle actually stacks up pretty good in terms of its earnings quality. 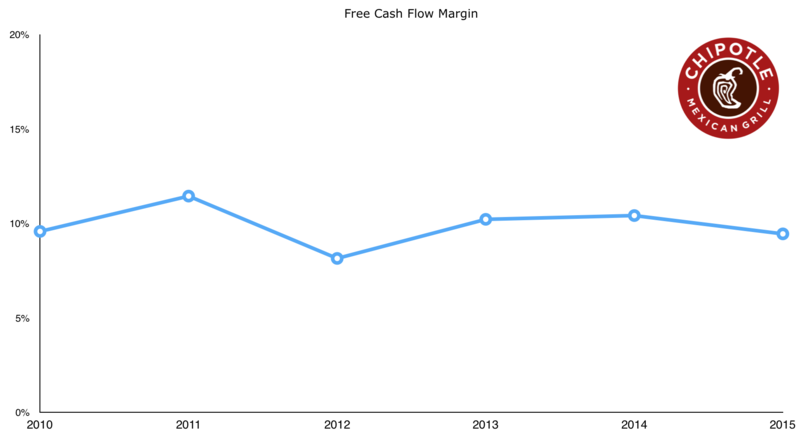 Average operating margins have come in at over 16% in the past five years and the company have converted around 10% of sales into hard free cash flow. In other words the business is a cash cow. For a restaurant stock, and considering Chipotle don’t operate a franchise model in the mould of McDonald’s, that’s pretty impressive. Despite that the latter is still the highest quality name in the sector with 30% operating margins and similarly high returns on capital. There’s a reason why it is one of the only restaurant stocks to have stood the test of time; it’s a very tough industry to survive in long-term whilst still delivering good shareholder returns. The key question then is why should you buy Chipotle Mexican Grill stock over McDonald’s? Or more accurately why would you buy Chipotle at $750 a share and 50x annual earnings versus McDonald’s stock at $100 a share, 20x annual earnings and 3.45% annual dividend yield? The only reason investors were doing that back in October of last year was because they were think about growth, of which there was an abundance at Chipotle. Revenue has risen by 21% a year on average since 2006. Earnings-per-share have increased almost twelvefold over the same time frame. At the end of 2006 there were a total of 581 Chipotle Mexican Grill restaurants spread out across the United States. As of the third quarter of this year that figure has risen to just under 2,180. All of those factors contributed to putting Chipotle stock, and prospective investors, firmly in the growth trap. Just work out the level of growth you would needed to have seen just to stand still. 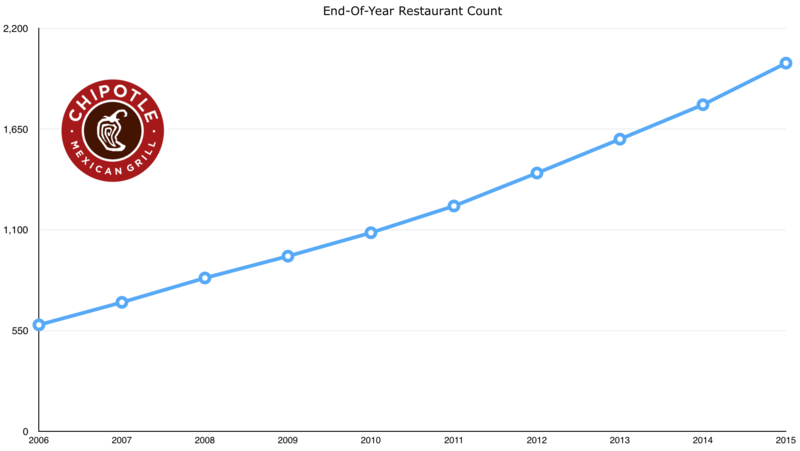 Let’s say that a decade from now you see the shares trading at 20x earnings; still pretty rich for a restaurant stock but a slight premium based on earnings quality and past growth. At a share price of $750 that means Chipotle would have to be making $37.50 a share in net income in 2025. Or put another way they would have to grow their earnings by an average of 9.5% a year. That’s a very reasonable assumption, but remember that’s just to stand still at $750 per-share. Say you were looking at the shares back then and wanted 10% annual returns from Chipotle stock over the next decade. At $750 per-share that implied Chipotle shares would be changing hands for $1,945 in 2025. At 20x earnings the company would therefore need to be making $97.25 in net income per share – equivalent to 20.5% annual earnings growth over the next decade. The downside to a mammoth P/E ratio like that is that there’s hardly any margin for error. Everything has to go right in order to avoid potentially major downside in terms of the stock price. Unfortunately for Chipotle investors they then saw a pretty major food scandal involving some nasty bugs and closed restaurants which has led to year-on-year same store sales declining by over 20% between the third quarter of 2015 and the same period this year (e-coli doesn’t really sound too appetizing after all). Revenue and earnings are down, and, as you’d expect with a P/E ratio of 50x earnings, the share price took one heck of a beating. Currently the stock is trading around the $400 per-share mark – some 40% below the 2015 peak. So that was the essence of the growth trap, but what about going forward? In the short term the continuing effects of the food safety problems are going to impact the business. At the end of last year Chipotle had 2,010 stores and generated $4.5 billion in revenue for the year as a whole. This year they’ve increased the store count by around 8% but revenues will likely only come in at around $3.9 billion. That gives you some idea of the impact that the food safety issues have had on underlying operations. To get around it is going to take time, operational changes and increased marketing spending in order to boost the brand again. Assuming that happens then there is still plenty of room for growth. Currently Chipotle has just 2,160 restaurants in the United States compared to approximately 14,250 McDonald’s stores and 7,250 Burger Kings. In addition the company have next to no presence abroad; in total they had 23 restaurants outside the United States at the end of 2015 of which 11 were in Canada. The issue then is what’s a fair price to take on the uncertainty on the one hand, versus potential growth and a restoration of their previous earnings power? Even assuming the company could return to making $15 a share in profits the current share price of $400 values them at 27x annual earnings. That still seems a bit rich despite the obvious good points; Chipotle still sports a stellar balance sheet with zero debt, and has to date funded its growth from existing cash flow. It’s exactly the type of business you should be looking out for at that right price. For me that would be around the 20-25x earnings mark at this moment in time. With management forecasting earnings-per-share of around $10 in 2017 that might take a while. Even recovering to the pre-safety issues level of earnings getting to a P/E ratio around the 20x earnings mark would imply a share price somewhere in the region of $300 to $350. It’s not clear at the moment why paying 40x 2017 earnings for Chipotle stock is a much better deal than say 30x 2015 earnings in the case of Starbuck’s stock. Will Chipotle shares fall further to meet that valuation? Maybe, maybe not. That’s the usual rationale for jumping in too early (i.e. what if you miss out whilst waiting for it to fall further?). The problem with that logic is that it also ignores the growth trap in that there’s a real chance the shares end up stagnating whilst underlying earnings catch up with the stock price.